The Hanging Gardens of Babylon were one of the Seven Wonders of the Ancient World, and the only one whose location has not been definitely established.Traditionally they were said to have been built in the ancient city of Babylon, near present-day Hillah, Babil province, in Iraq. The Babylonian priest Berossus, writing in about 290 BC and quoted later by Josephus, attributed the gardens to the Neo-Babylonian king Nebuchadnezzar II, who ruled between 605 and 562 BC. 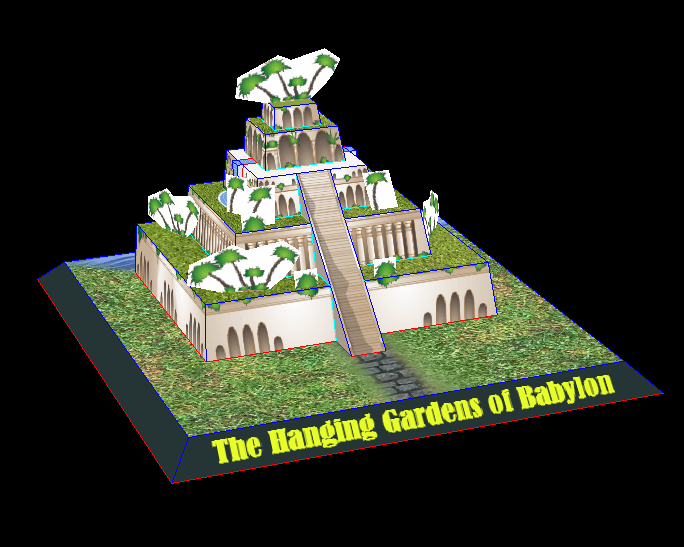 There are no extant Babylonian texts which mention the gardens, and no definitive archaeological evidence has been found in Babylon.One legend says that the Hanging Gardens of Babylon were created by Emperor Nebuchadnezzar II, the king of Babylon, for the Persian wife, Queen Amytis, because she missed the green hills and valleys of her homeland. Emperor Nebuchadnezzar II also built a grand palace that came to be known as 'The Marvel of the Mankind' or ('Al A'akheed vach altira'av chad') . Build order: Base, building, stairs, waterfalls, and add palms and bushes if you want.